RUTLAND—Rutland native Kerry Branon returned home this weekend for the Vermont premier of her first feature documentary film, “Huntwatch,” which aired Sunday at the Middlebury New Filmmaker’s Festival. She was excited to share the film, which protests eastern Canada’s commercial harp seal hunt, with her family and friends—and to bring home even bigger news: the international rights to the film were recently picked up by Lionsgate and Discovery. “Huntwatch” will be broadcasted nationally on Discovery Channel Sept. 22. “I feel really relieved to be getting this important story out into the world,” Branon said. Branon co-produced the film with three other team members from the International Fund for Animal Welfare in Cape Cod, where she has worked for over 13 years. IFAW was founded in 1969 to stop the seal hunt, but has since expanded to 40 countries and now works on a number animal welfare projects. “Huntwatch” is what Branon calls an “archive show,” merging video clips from “hunt watchers” who have filmed the gory event over a span of four decades. By capturing the activists’ fight through various moments of video, the documentary emphasizes the important role that cameras and media play as the only weapons available to fight back against the seal hunt. According to Branon, much of that challenge was brought on by the inevitable and prolific carnage present in much of the footage. The director, producers and editors worked to make the film digestible to a broad audience. Branon’s passion for animals was born during her childhood, which she spent in Vermont. Her grandparents owned a dairy farm in Fairfield, and she believes that being around the cows and barn cats at a young age gave her a soft heart for animals. She credits her sixth grade teacher, Liz O’Neill, for encouraging her to become an extrovert, and both of her grandmothers, Edith Fuller Cushman and Margaret Mulcahy Branon, who had a strong influence on Branon as a child. Before she left for college, Branon was an active part of the Rutland community. At Mount Saint Joseph Academy, she played soccer, basketball and tennis, served on student council and became the president of Rotary’s Interact group during her senior year before graduating in 1993. She left for Simmons College, set on studying environmental science, but changed her mind and transferred to Suffolk University, where she graduated with a degree in communications and journalism. IFAW hired Branon soon after commencement, and there, she has combined her passions for journalism and the environment. Before producing “Huntwatch,” she created many short documentaries about animals and nature, which were used in campaigns to help the public understand the nuances of animal welfare issues. Looking ahead, Branon predicts that her next feature-length documentary might focus on elephants and the African ivory trade. Until then, she’s pleased that “Huntwatch” will be delivered to a large audience, and hopes the film will create action among its viewers. To catch the “Huntwatch” T.V. premier, tune in to the Discovery Channel on Sept. 22 at 10 p.m. EST. 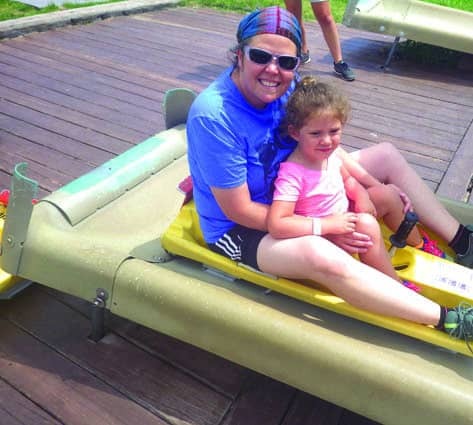 Kerry Branon, who co-produced the documentary film “Huntwatch,” prepares to ride the alpine slide at Bromley with her daughter, Isabella.